Stockwell War Memorial to the dead of the First World War who lived within half a mile of Stockwell Common has 574 names. After the end of the war in 1918 the site – the area known as the Triangle, at the junction of Clapham and South Lambeth Roads, the last vestige of what had once been Stockwell Common – was identified as the most suitable place for a fitting tribute. It was legally secured and eventually conveyed to Lambeth Borough Council. It was decided that the design of the monument, a clock tower built of Portland stone, would be chosen through competition by a committee of the Royal Academy. Raising the money required was a problem and was not completed until after the Memorial was unveiled. It did not help that the price of building materials had rocketed as Europe set about repairing the damage caused by four years of destruction. The Memorial Committee organised numerous fund-raising events: on the first anniversary of Armistice Day, the Stockwell Palladium Cinema at 211 Clapham Road (the building now houses a café) hosted an evening of Mary Pickford and Charlie Chaplin films and Dr. Pearson appealed for donations. There were also fancy dress dances, concerts and fêtes at which local celebrities were encouraged to give their services, as well as their cash. There was even a minstrel show, which was then a popular and acceptable form of entertainment. The troupe, the well-known Police Minstrels, performed in evening dress and blackface. Benjamin Clemens, a Chelsea-based sculptor, designed the figure of Remembrance adorned with a laurel wreath and a broken sword of war at her feet. Beneath her are the words, “To the Stockwell Men who Served in the Great War, 1914–1919.” The stone carving was executed by Greenwich-born Frederick Francis. Dr. Caiger, whose only child Frederick had been killed at the Somme in 1916, donated the four-faced clock. He stepped in after an initial offer from jeweller and clockmaker Sidney Sanders, who wanted his branding on the clock face, was rejected. 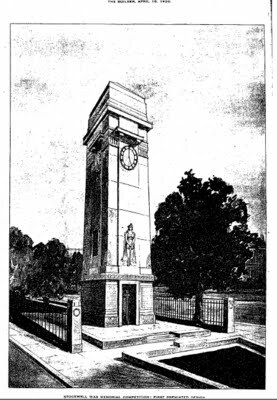 By early 1922 the Memorial was ready to be unveiled and dedicated and the date for the ceremony was set for Wednesday 3 May. Hours before it was due to begin, under lowering skies, crowds began to gather in the Stockwell Triangle. People watched from the windows of the surrounding houses; they pressed against the railings. Thousand packed the space from the Underground station to Stockwell Terrace. As the ceremony started, there was a solemn hush, broken only by the occasional clanking of a passing tram. “Among the onlookers were many ex-Service men and women wearing medals and decorations, and a large number of women in mourning, carrying wreaths or little bunches of flowers, according to circumstances, to place at the foot of the memorial in honour of their fallen,” reported The South London Press. The crowd sang “O God, our Help in Ages Past” and prayers were read. A host of dignitaries and prominent local figures was in attendance, as well as police and military bands and the choir of Stockwell Orphanage. Stepping down from the platform, Princess Alice, Countess of Athlone, dressed in deep black, released the Union Jack covering the face of the Memorial, declaring: “To the glorious and lasting memory of the men of Stockwell, who laid down their lives for their King and Country.” The notes of the Last Post and the Reveille, sounded by buglers of the East Surrey Regiment, rang out, and simultaneously, at 3.25pm, the clock in the tower was set going. The hymn “For all the Saints” followed. Finally, in a voice heard across the gardens, the tower was dedicated by the Bishop of Kingston. After the site and the Memorial were presented to the Mayor of Lambeth, formal wreaths were laid. People walked round the Memorial, some scanning the names on the panels, others placing their own floral tributes. Then the storm that had threatened all afternoon burst and dispersed the crowd. The Stockwell War Memorial website has information on many of the men named. Vauxhall History is supported by The Vauxhall Society. Vauxhall History is an online research database of knowledge and images covering aspects of the history of the London parliamentary constituency of Vauxhall. Sign up to receive FREE Vauxhall History posts in your inbox. Copyright © 2019 Vauxhall History · Data provided is for information purposes only. Although carefully collected, accuracy cannot be guaranteed.